Make your room a ‘home away from home’! Rent a MicroFridge unit with the only approved microwave permitted in your room. A MicroFridge features a microwave with turntable, 2.1 Cu.Ft. refrigerator, and freezer. 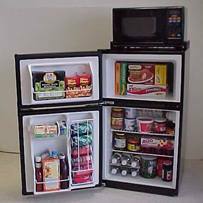 With a MicroFridge, you can have cold drinks, snacks, frozen dinners, hot meals, and ice cream right in your room. No more late night trips to convenience stores, raids on the vending machines, or calling for food delivery. And now this benefit is available to you! For Academic Year 2019-2020, A MicroFridge unit will provided in each room in Men's Hall, Deluxe Doubles, and CTE Upperclass Singles at no additional cost! LOW COST. When splitting costs with your roommate, the rental of a MicroFridge unit is a fraction of the cost of buying. And you don't even have to jam it in your car with all of your other belongings! Your MicroFridge unit will be delivered directly to your residence hall room. 100% GUARANTEE. If your MicroFridge unit quits working for any reason, we replace it free of charge. No waiting for service or sending it away to be repaired. Any profits from rentals will directly benefit you as they are reinvested in the residence halls. PLEASE NOTE: Due to its patented power saving features, the microwave oven on the MicroFridge unit is the only microwave oven permitted in student rooms. Only one MicroFridge is allowed in each room. We encourage roommates to work with one another to share the cost of the MicroFridge. If your order or payment is received after July 31, 2019, your MicroFridge will be delivered as soon as possible following Opening Day. If you have questions or concerns, please contact Matt Allbright, Assistant Director of Operations, 308-865-4800 or email allbrightmd@unk.edu.